Nowadays immigration to Lithuania became quite popular among citizens of different countries, especially countries of CIS (The Commonwealth of Independent States), because this is cheap, easy and fast way to get total entrance to European Union, move across Schengen countries freely and use all services and facilities of European countries. The most popular and reliable way to immigrate to European Union is getting residence permit in Lithuania on the basis of company set-up in Lithuania or purchase of the company in Lithuania. Temporary residence permit in Lithuania – a document granting a foreign citizen right for a temporary residence in Lithuania. It is issued to foreign citizens, who are not citizens of 28 Members states of the European Union. It is usually issued for one year (at the end of the year may be extended for one year, and up to 5 years). For persons of Lithuanian origin and foreign citizens, who retained the right to citizenship of the Republic of Lithuania temporary residence permit is issued for five years. The decision for a temporary residence permit in Lithuania to foreign citizens is resolved by the Migration Department. 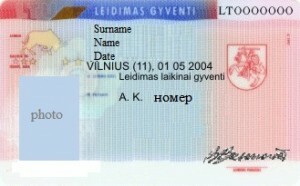 An application for the first temporary residence permit is reviewed during 2-4 months from the date of the submission of the relevant institution, and application of a foreign citizen, who has a long-term residence permit in Lithuania issued by European Union Member State within 4 months after submission of the relevant institution. Reobtaining the temporary residence permit is considered not later than within two months from submitting the application. Permit for a long-term residence in the Republic of Lithuania to reside in the European Community (permanent residence permit) is a document entitling an alien to reside in the Republic of Lithuania and certifying the foreigner permanent resident status. Representation at the state authorities, companies, entities and organizations of the Republic of Lithuania. What is the main activity of EUROMIG project? What is the procedure for getting residence permit in Lithuania? How about visa to Europe? How can I get the visa to come to you? Can I work after getting residence permit? How much do we harge for our services? When should I make payment and how? Which documents do I need for the process? Can the wife and other family members come also to Lithuania? We are well known international business consulting company located in Vilnius. We propose all kinds of business help for your business and also help with immigration to Europe. On your request we will register company for you and provide different help for your business activity. Our specialists will propose you the best option for buying business and immigration to Europe. We have 2 types of immigration to Europe – based on doing business in Europe and purchase of real estate. Depends on your investment and interest will propose you the best variant. Also we want to admit that we don’t provide visa help and don’t provide invitations. Our main countries for immigration process are Lithuania, Latvia, Slovenia and Spain. After the procedure you will get special document – residence permit in Europe, which allows living and doing activity in Europe. First of all you should inform us what your main aim is: business development or just immigration. This information will help us to find the best option exactly for you. Specialists of our company start the procedure of setting up the business and immigration procedure after payment for the services. You can come to our office, which is located in Vilnius, Lithuania, and make payment here, signing the agreement at the same time. The other option for payment is bank transfer, which should be made in advance. Immigration to Europe is based on setting up business in Lithuania. For the procedure you should open visa by yourself and come to Lithuania to our office, which is located in Lithuanian capital – Vilnius. Specialists of our company will organize the procedure of selling ready company for you and will help reliably to get temporary residence permit in Lithuania for 1 full year. In 2-4 months after applying you will be able freely to come to Lithuania and get your ready document – residence permit. After getting residence permit you should start your own business. After 5 years you will be able to get permanent residence permit, after 5 more years – Lithuanian residency. If you want to get long term visa to Europe, we propose you to buy real estate in Lithuania. For that purpose you can open short term visa to Lithuania or any other Schengen country and come to Lithuania for buying property. We sell different types of real estate in Lithuania, propose apartments according to your desires and requirements. Ownership of real estate will help you to get Schengen visa to Europe and to live there or give your apartment in rent. We sell different types of real estate in Lithuania. It can be commercial real estate for your business, private apartments and cheap options in little cities of Lithuania. After buying or setting up company in Lithuania we will help you to get residence permit in Lithuania. It means that you get this document for 1 full year and can live in Europe without any obstacles during this period. In order to work in any company of Lithuania you need to get work permit in Lithuania, what is quite difficult for foreigners. But if you register a company and start real business in Lithuania, you can freely work in your company without any permits or other obstacles. You will become the employee and the director of the company at the same time. For getting residence permit in Lithuania, the foreigner should open the company and only after 6 months can apply for residence permit in Lithuania. The main requirement – to establish company with 29000 euro of share capital and to employ 3 Lithuanian citizens or workers with permanent residence permit. After that the foreigner will get residence permit in Lithuania and should start real business. Also for doing business the owner of the company needs to pay taxes and to order accounting services. Such as the decision is taken not by us, so we don’t have the right and possibility to refund. Our specialists make our work the best and this work costs money (together with state fees, translations, notaries and other expenditures). When should I make payment and how? What about visa surity? For the process of immigration to Europe you need have only international passport and photo. All other documents and translations we prepare by ourselves. Also to apply for residence permit, you should come to Lithuania. It means that you need to open visa by yourself and arrive to our office for the procedure. Your wife or even business partner will be able to become shareholder of your company and get residence permit as well. Talking about your children, so if they are under 18 years old they can come together with you and your wife and get residence permit automatically. For more detailed information contact specialists of our company.